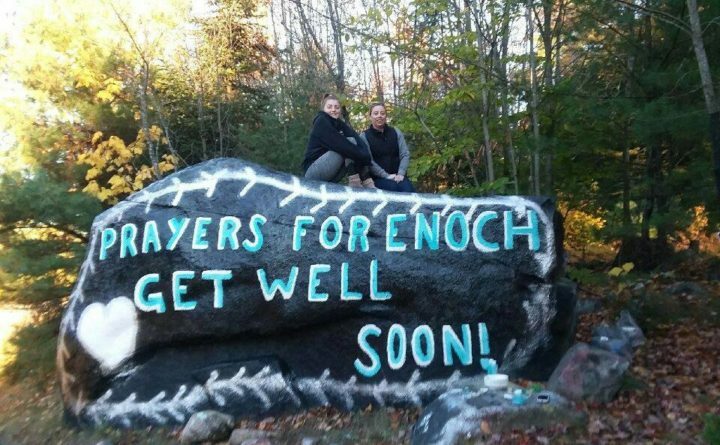 Heather Stevens and her daughter, Makenzie Breton, 17, both of Lee, along with Aleah Perfect, 16, of Mattawamkeag, painted a rock on Route 6 in Lincoln "to do something nice for Enoch and his family," Heather Stevens said Wednesday. PORTLAND, Maine — A convoy of dump trucks, motorcycles, buses and cars perhaps a mile long is set to drive past 2-year-old Enoch McGovern’s window at Eastern Maine Medical Center on Oct. 27 in a show of support for the injured toddler. Organizers said it’s simply designed to bring the little boy some joy. The 2-year-old remains at the Bangor hospital recovering from serious injuries suffered the afternoon of Oct. 4, when his mother, 26-year-old Heidi McGovern, who suffered from depression, jumped in front of an Irving Oil tanker truck on Interstate 95 in Lincoln while holding Enoch. After reading about the incident, a member of the Facebook page Maine Diesels, Troy Gamrat, posted on the page asking other truckers to join him in driving by the hospital to support the child and his family. Hollis resident Jason Perry, who runs the page, took the idea a step further. Perry, who has organized convoys of vehicles in the past as fundraisers, said Tuesday he expects as many as 500 dump trucks, motorcycles, pickup trucks and other vehicles to join The Convoy For a Cause, scheduled to leave the Winterport Dragway shortly after 1 p.m. Saturday, Oct. 27. Perry hopes Enoch will watch the excitement either from his window or maybe even the sidewalk in front of the hospital. Perry said his first concern was the circumstances under which Enoch was injured, but he was assured that “the little boy just loves big trucks,” and he noted photos and videos that have circulated since the incident showing him playing with toy trucks. Previous convoys, such as one last summer in Harpswell to honor his co-worker at Bath Iron Works, Levi Alexander, who was killed in a motorcycle crash, drew about 250 trucks, Perry said. This time, truckers and others joining the convoy will pay $10 per person to enter the Winterport Dragway, where the convoy will assemble beginning at 10 a.m., Perry said. While the exact route is not set in stone, Perry said Tuesday that shortly after 1 p.m., the convoy will head up Interstate 95, down to Route 2 and past the hospital. One group of Harley Davidson riders from southern Maine planned to meet at LA Harley in Lewiston to drive to Winterport together. “I wouldn’t be surprised if it’s a mile long,” Perry said of the convoy. On Tuesday, the McGovern family issued a statement through the hospital conveying their “deep and sincere gratitude for the outpouring of support for our sweet boy and entire family,” and asking for “space and privacy” as Enoch continues to heal. A separate motorcycle ride to benefit the family will take place Saturday, hosted by the Iron Mustang Riders Group. Riders will gather at 10 a.m. at the Dunkin’ Donuts in Newport, travel to Elephant Mountain and return to the Dunkin’ Donuts, organizer Michelle Ann Snow of the Iron Mustang Riders Group said Thursday. A GoFundMe fundraiser established to help pay for medical bills and funeral expenses reached $30,000 early Wednesday morning.